Earlier today, Nintendo devoted 25 whole minutes of its E3 Nintendo Direct news blast to introducing the new Super Smash Bros. for the Switch. The game was teased earlier this year, without so much as even a name reveal, and the company made up for those few months of silence by dropping as many details as the human brain can possibly process within the presentation’s limited time. For starters, the game is launching on December 7, 2018 and it’s called Super Smash Bros. Ultimate, a label it’s trying to live up to by bringing together every character that’s ever appeared in a Smash Bros. game. That means guest characters like Solid Snake (along with his beloved original voice actor, David Hayter) and Street Fighter’s Ryu are back, as well as one-off oddities like Pichu, Young Link, the Pokémon Trainer, and Star Fox nemesis Wolf. 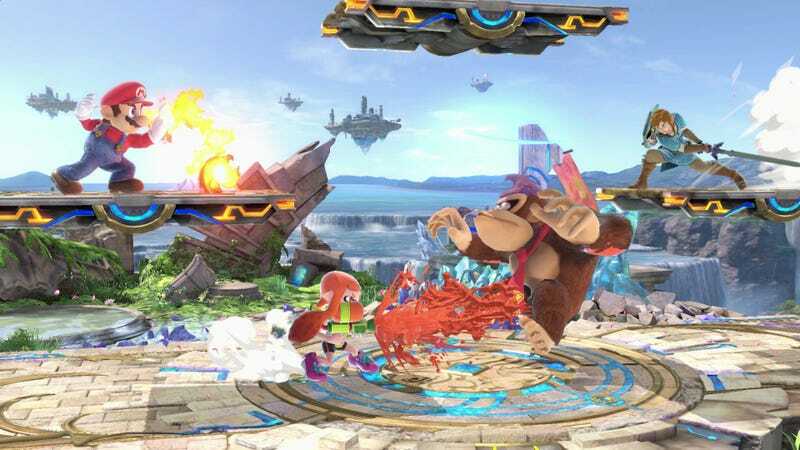 Longtime Smash director Masahiro Sakurai tried tempering expectations for a huge selection of never-before-seen characters, noting the developers’ biggest goal is reaching back and reviving all these forgotten fighters. The presentation did include a look at three new characters, though: the half-squid, half-kid Inklings from Splatoon; Princess Peach’s brunette doppelganger Daisy; and Ridley, the dragon-like space pirate from the Metroid series. Further, some returning roster members are getting significant makeovers, like Link, who now dons his Breath Of The Wild gear, and Zelda, who’s been remade to resemble her character in A Link Between Worlds. The game is also bringing back plenty of stages that have been lost along the way, like Melee’s infamous “Big Blue,” support for the impossibly long-lived GameCube controller, and making some small but significant changes to the flow of a fight. You can find all of those details in the exhaustive breakdown Nintendo released this morning, and even more information, including some early soundtrack samples, on the Super Smash Bros. website. If you only listen to one, we suggest making it this killer “Vega Stage” remix by Yoko Shimomura.